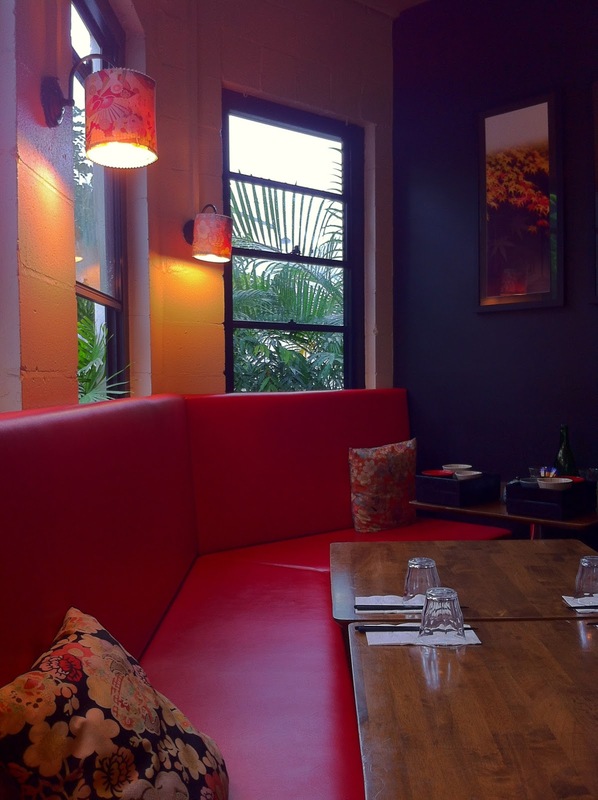 This morning I met up with a close friend of mine to try Japanese-style breakfast at a restaurant called Mizu in Teneriffe. Despite the pouring rain, we still managed to get there and were immediately greeted by energetic Japanese staff members. I wanted to try Mizu not only because I absolutely LOVE Japanese food but also because it is probably the only Japanese restaurant in Brisbane that does Japanese-style brekkies. I was really interested as to what would actually be on the menu – I have been to Japan before and the traditional breakfasts were very healthy, often consisting of rice, miso soup, grilled fish and some pickles. Some of their menu options included onigiri (grilled rice balls), okonomiyaki (savoury pancakes), simmered chicken mince on rice and breakfast obento boxes with prices ranging from $6.00 to $16.00. In terms of drinks, they have coffees, western teas, Japanese green teas, etc. What caught my eyes was the hot Matcha Green Tea Latte (also available iced). My friend and I both tried the hot matcha green tea latte. It was very authentic and the creamy texture of the milk and the bitter aroma of the green tea balanced well with just a tad of sweetness. 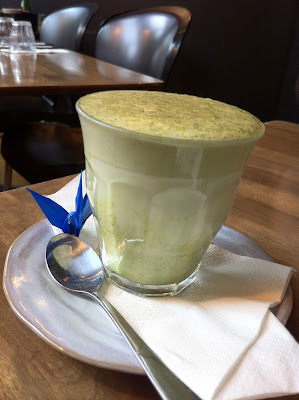 The frothy milk on the latte was sprinkled with some green tea powder and the latte was served even with a little paper crane next to the glass. 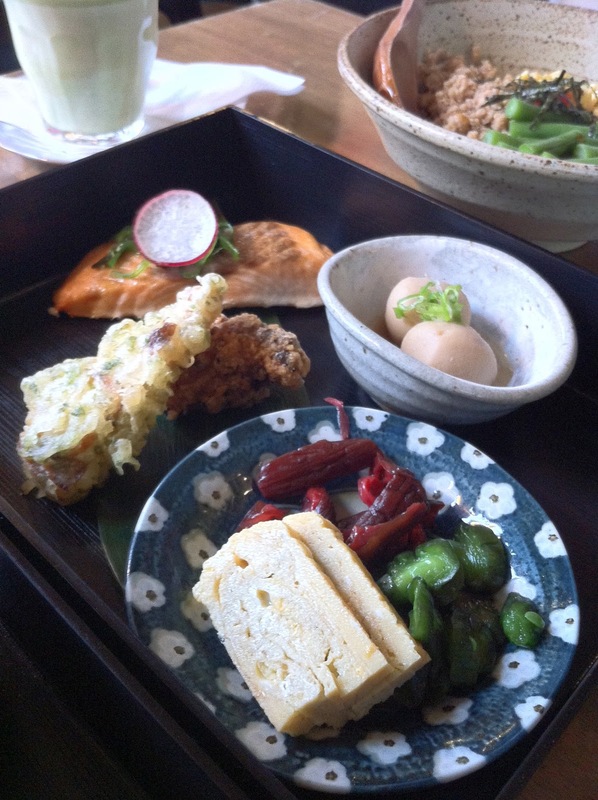 I ordered the Mizu Breakfast Bento Box which usually comes with the chef’s selection of traditional Japanese dishes – today, I got grilled salmon, simmered taro, lightly battered fish cakes and chicken, potato salad, tamagoyaki and a selection of pickles. These dishes were accompanied with rice and miso soup. All the side dishes were very appetising and even the rice was quite special. Rice to me is more like a side dish than a main. I hadn’t tasted rice as delicious as Mizu’s in a while – each grain had just the right amount of water and stickiness. It wasn’t too dry nor was it mushy. You might think I’m crazy when I say that rice does make a huge difference to how the rest of your dishes taste like but believe it, it makes a lot of difference! I love traditional Japanese bento boxes because they offer you a huge variety of food in small amounts so you can taste lots of different types of foods in one meal! I was hoping it wouldn’t be too heavy for a breakfast option and it really wasn’t! However, it was a big meal though – I had to ask my friend to help me eat some dishes! My friend ordered the “Tori Soboro Gohan” which consisted of simmered chicken mince in teriyaki sauce accompanied by Japanese-style scrambled eggs and green beans on a bed of steamed rice. I managed to try a little bit of it and again, it was delicious and not at all too heavy for a breakfast option. If you like traditional Japanese-style dishes, I’d really recommend you to pay Mizu a visit on a weekend and try their breakfast! I’d really like to come back here one day to try their lunch bento boxes! The price seems adequate for lunch and breakfast but dinner can become a little pricy. I would also like to come back to try their sashimi! Being a huge sashimi lover, I usually base my opinion of a Japanese restaurant on how good they make their sashimi. Presentation, degree of freshness and serving portions are absolutely crucial to making the perfect sashimi dish! I will be back one day, Mizu! Please have good sashimi! Onegaishimaaaaaasu! Have you tried their sashimi yet? Personally (just my opinion), their sashimi is not worth the money...It's fresh, nicely cut, but wayyyyyy too little for their price.. the pieces were as small as my pinky (and I'm a girl)...If I have to pay high price for sashimi, I would rather pay a little more and have them at Sono~ Sashimi at Sono is the best !!! !